How to Convert YouTube to MPEG with YouTube to MPEG Converter? YouTube is certainly a wonderful existence since it provides us with all kinds of videos. We can enjoy latest music videos, watch funny hot videos, and watch latest movie trailers. And we can also share them with our friends and family. However, not only that, most people tend to watch favorite YouTube movies offline, or enjoy them on extensive devices as well as players, like Windows Media Player, Apple QuickTime Player, TV, DVD, home movie theater, etc. Even for some special videos you want to save for a long time with high video quality. In such case, it is necessary to download and convert youtube to MPEG, because MPEG has some prominent advantages. For example, the common-used standards of it are MPEG-1(.MPG), MPEG-2(.MPG) and MPEG-4(.MP4). And it is supported by many popular media players and devices. And it delivers high video quality while stay with small file size so that you can store more videos in your devices. Therefore, this post will provides you with effective solutions to convert YouTube video to MPEG for unlimited enjoyments. Part 1. Essential Extension – How to download YouTube video? Before convert YouTube videos to MPEG, it is necessary to ensure that the YouTube vides have been downloaded. If not, you need to download YouTube videos first. Here I would like to recommend Leawo YouTube Downloader for you to download YouTube videos. Leawo YouTube Downloader can be regarded as a professional YouTube Downloader for it can download YouTube videos with high video quality in just a few minutes. Besides, it can also download videos from other online video websites like Facebook, Dailymotion, AOL, iFilm, Myspace, and Dailymotion, etc. Let’s follow to simple steps below to download YouTube videos now. Step 1. 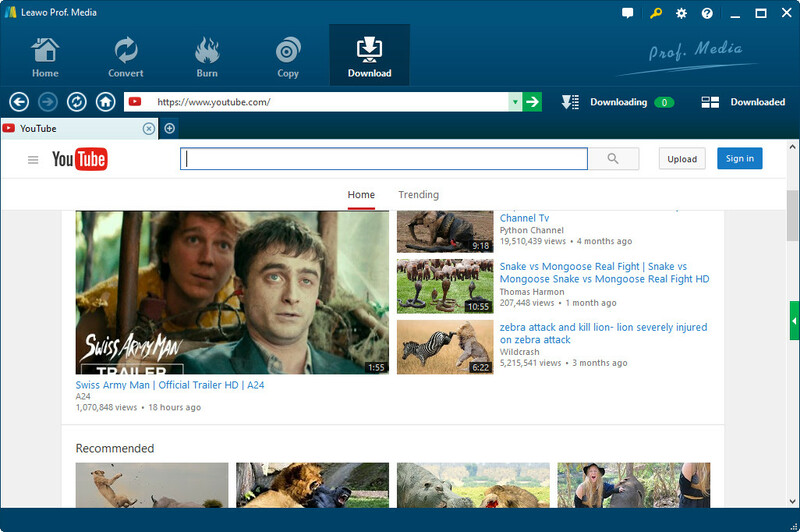 Download and install Leawo YouTube Downloader first. Choose the desired videos to download by clicking the green triangle on the right side of the main interface. And then the videos can be selected to download list. Click download icon. Step 4. Check and manage your downloaded YouTube videos. After that, check out the downloading video in the Downloading tab next to the address bar, when the video finishes downloading, check it out under Downloaded tab. After downloading YouTube videos, now it can turn to the conversion process. Here we will use Leawo Video Converter to finish the conversion. Leawo Video Converter is regarded as a professional YouTube to MPEG Converter since is able to convert YouTube to MPEG with high quality in just several seconds. 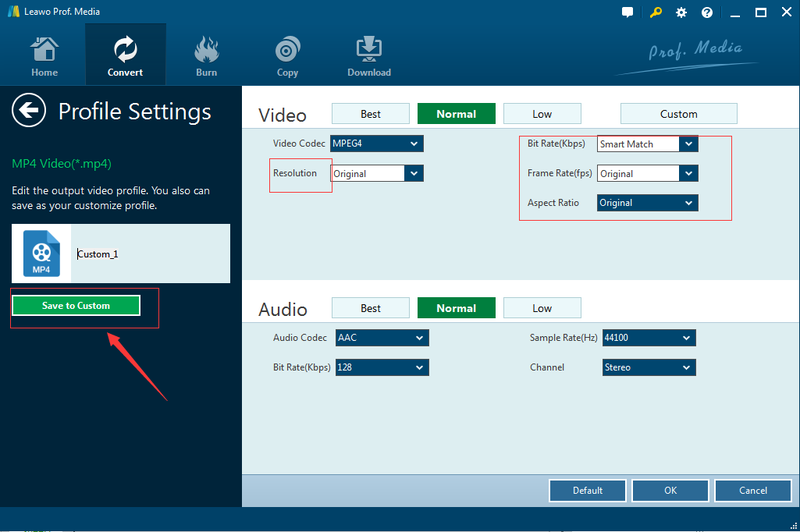 Moreover, it can convert videos and audio files between almost all formats like MP4, AVI, FLV, MOV, WMV, MKV, M4V, MPEG, 3GP, etc. In addition, it has rich video editing features. In short, it could be the best video and audio converter. Let’s start to convert YouTube to MPEG with the help of Leawo Video Converter. Please confirm to download and install Leawo Video Converter. And then you can follow the guide below step by step. Click “Add Video” button to load source YouTube video files into this program. Or direcctly drag and drop YouTube video files into the program. Turn to drop-down box on the left of green “Convert” button. Click it and select the “Change” button to enter “Profile” panel. Then choose “MPEG” under “Format >> Common Video”. Alternatively, you could also choose to find “MPEG” output profile by using the searching bar under the “Profile” button on the left. Note: On the drop-down box, click the “Edit” option, and enter the “Profile Settings” interface to adjust video parameters of the converted MPEG output profile. Click the big green “Convert” button and there’s the pop-up window where you could choose your desired output directory, and then set it in the “Save to” box. After all done, click the “Convert” button to start converting. The whole conversion process would only take several minutes. After the steps above, you have already get the converted MPEG files from YouTube. It is high-efficiency, easy-to-use even for green hands. And it is also popular for us to use. However, there are still some people would not like to download any apps or programs. In this case, YouTube to MPEG online converters can be a choice. 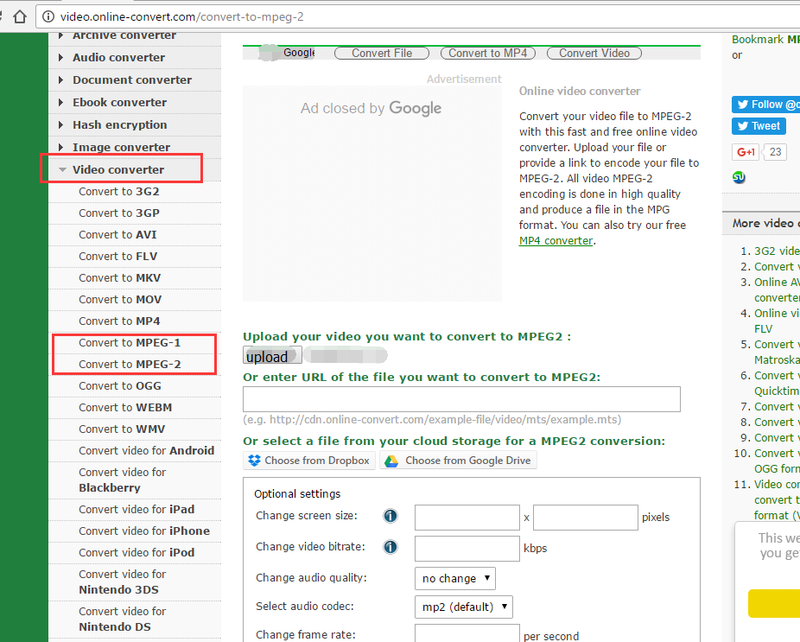 There are also lots of YouTube to MPEG online converters for us to choose from, such as onlinevideoconverter.com, online-convert.com, convertfiles.com and office-converter.com, etc. Here I would like to take online-convert.com as an example. You can follow the guide below for reference. Step 1. 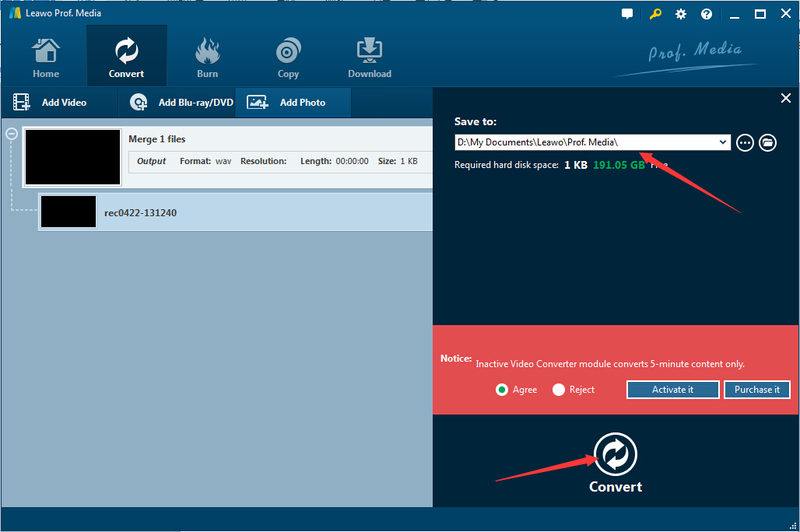 Open online-convert.com, choose “Video converter” on the interface. Step 2. On the left column, choose “Convert to MPEG-1″ or “Convert to MPEG-2″. Step 3. 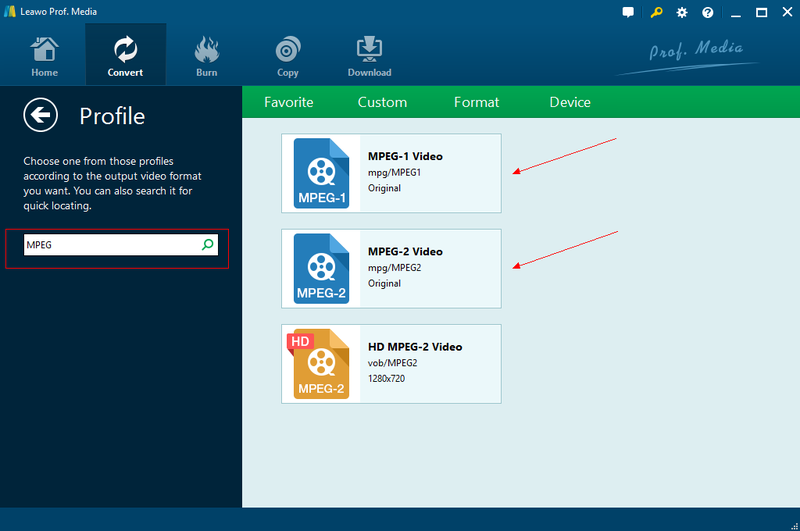 Upload your video you want to convert to MPEG, or enter URL of the file you want to convert to MPEG. Step 4. Do some specified settings like screen size,video bitrate,audio quality,frame rate, etc. Step 5. Click “Convert file” button to start converting. All above methods can both convert YouTube video to MPEG. Indeed, YouTube to MPEG online converter is a convenient way, but it still has non-ignorable disadvantages. For example, you need to take more time to upload your video, you cannot download YouTube video on it directly. And you may get a relatively poor quality conversion that takes up a lot of space. For me, I prefer Leawo Video Converter although it needs to pay if you want a full version. However, you can convert YouTube to MPEG in just a few seconds. And you will get the converted MPEG3 files without quality loss. And it can work even your computer is offline. In short, Leawo Video Converter is one of the best YouTube to MPEG Converter.